The Silver Age of comic books was a strange, strange time. It saw Batman in outer space encountering aliens, the introduction of crazy concepts like the Legion of Super-heroes, but more importantly, it saw the ushering of the superhero pet. Now, while not every entry on this list is a product of the Silver Age, many of the more outlandish concepts were birthed during this era. Many of them have not continued into the present, but here’s hoping comic fans will forever have a soft spot in their hearts for adorable creatures with superpowers. If you are an animal lover and comic book nerd, there is no reason at all that you shouldn’t being cooing your hearts out over the characters on this list. Perhaps a reflection of the space race, Beppo the Supermonkey was introduced in 1959 as a Kryptonian chimp that Superman’s biological father, Jor-El, experimented on to ensure his son’s safety in his trip to Earth. Well, as monkeys are prone to do (yes, I realize chimps are not monkeys), Beppo found himself into some mischeif and stowed away aboard baby Kal-El’s rocket when it blasted off from Krypton. In perhaps one of the saddest turn of events for a superhero’s pet, Beppo is seperated from Kal-El upon landing, only to come back into his life later on when teenaged Clark Kent has become Superboy. When Beppo gets into trouble in Smallville, Superboy does the obvious: he takes him into space and abandons him. Alone. What a martyr. In the end though, Beppo meets up with Supergirl and is introduced to the other members of the Superpet family, with whom he eventually forms the Legion of Super-Pets, until he is wiped from existence forever via the massive retconning of Crisis on Infinite Earths. Continuing the trend of superheroes mistreating their pets, we come to Lobo’s pet bulldog, Dawg. While there really isn’t much known about him, Lobo was always quick to deny his ownership of Dawg, should he find his way into trouble. In the end, Lobo stomped him to death. For a character that has killed his entire race, his own daughter, the Easter Bunny and Santa Claus, Lobo’s cold blooded murder of his own pet was perhaps the most sickening. Poor Dawg, we hardly knew thee. Though he has appeared primarily only on television, Gleek and his owners, the Wonder Twins, are fond memories of those of us that grew up watching Super Friends. Gleek is a blue space monkey that really doesn’t do much other than provide comic relief, as well as provide the lone reason to consider Zan and Jayna cool. Gleek seems to be smart enough to understand English, yet he only communicates via dancing around and playing charades, along with alien monkey babble. It’s hard not to have a soft spot for the guy, even if the Wonder Twins are much maligned by most of the die hard comic book community. I, for one, am all about importing television-created DC properties (*cough*, Lois & Clark) into the canonical DC Universe, so Gleek is welcome in my long boxes anytime, even if it means taking the Wonder Twins with him. Perhaps the creepiest of all the Super-pets, Comet is unique in that he is not Kryptonian, nor is he really a horse. Because of an accidental potion that he takes from Wonder Woman baddie Circe, Comet, originally a centaur of ancient Greece, is transformed into a full bodied horse. To make up for her mistake, Circe gave him superpowers, thus creating Superhorse. Later, Comet would meet Supergirl, who would befriend him, and whilst on a mission in space, is placed under a spell that would allow him to turn human whenever a comet passed through the solar system. And even though their relationship began as horse and rider, Supergirl and Comet’s human form, Bill Starr, became romantically involved. Though I don’t think I have to make a clever pun about "riding", this is exactly what I’m talking about when I say that the Silver Age was effed up. So technically, Ampersand is not a superhero’s pet. Unless of course, you consider the last man on Earth a superhero. Regardless, Yorick Brown from Y: The Last Man holds the mythical qualities of a hero, and by default, Ampersand gets a spot on this list. As Yorick’s pet Capuchin monkey, Ampersand is single handedly responsible for the entire story that we are able to enjoy over the series’ 60 issues. Starting out as a trainee to be a helper monkey to the disabled, Amp’s little life holds a lot more secrets than initially thought. The relationship between Yorick and Ampersand is really the emotional strong point of the series, more so than any relationship between two human characters. For all the characters that come and go, and even the overarching plot of Yorick’s search for his girlfriend, it’s Ampersand that dictates where the adventure leads, and ultimately, that has the most emotional resonance of any supporting players in the book. One of the few things to come from Chris Claremont that is actually awesome, Lockheed is Kitty Pride’s alien dragon that while a badass, is also cute as hell. He’s got the ability to block telepathic probes, and can understand dozens of languages. As with any dragon, he can breath fire at extreme temperatures. As loyal a pet as any, Lockheed also has a character progression that is as complicated as most other members of the X-Men. He’s gone from a comical side character to uber-intelligent alien dragon acting as a mole within the X-Men, and though his recent deception and subsequent departure in Joss Whedon and John Cassaday’s Astonishing X-Men was a shock, it has been made clear that his devotion to Kitty was genuine, and I wouldn’t be surprised if they ended up back together again soon. Most recently, he’s joined the Pet Avengers in their new series, along with the Frog Thor and Lockjaw, the teleporting bulldog. Another pet of Supergirl, Streaky started life as an average domesticated house cat, but was given the powers of a Kryptonian when Supergirl discarded a strange form of Kryptonite she was experimenting on, and its effects were transferred to Streaky. As a member of the Legion of Super-Pets, Streaky had many a great adventure, and hawked up hairballs that had the retention strength of steel. Though Streaky would be retconned back to normalcy during Crisis on Infinite Earths, the character has remained present in the current DCU, albeit as a normal house pet. However, superpowered Streaky still continues to appear in out-of-continuity titles like Tiny Titans and Supergirl: Cosmic Adventures in the 8th Grade. Most recently, Streaky makes an appearance in Supegirl’s Wednesday Comics strip by Jimmy Palmiotti and Amanda Conner. A German Shepard that was taken in by Bruce Wayne when his previous owner was kidnapped, Bruce soon had Ace wearing a mask and fighting crime, just like every other youngster that has come into his life. Though he made regular appearances from his inception in 1955 through the mid 1960’s, the post-Crisis DCU saw less need for a crime fighting Bathound, instead relegating Ace to the role of a normal dog, but hasn’t been seen since "No Man’s Land". While he was a prominent character (complete with cape and cowl) on the Krypto animated television show, the classic Ace was last seen in comics during Final Crisis: Superman Beyond, where he is amongst the characters Superman encounters in Grant Morrison’s comic book Limbo. Personally, if any superhero needs a pet, it’s Batman. The man is high strung as it is, and a canine companion is the perfect outlet for his stress. Aside from pummeling the faces of crooks, anyway. 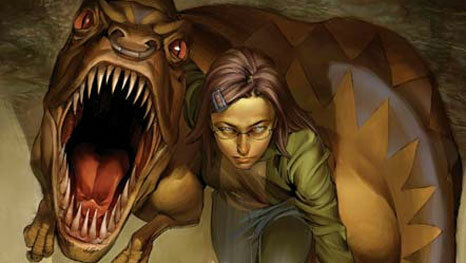 The Runaways’ pet genetically engineered raptor, Old Lace, is one of the most devoted superhero pets in all of comicdom. She is telepathically linked to Gertrude Yorkes, and later to Chase Stein. Named by Gert when she was using the superhero codename "Arsenic", Old Lace became a quick companion to the Runaways, often defending them in battle. Though the telepathic links she had to characters ultimately put her under their control, she was shown to have a fair amount of free will and the intelligence to make her own decisions. After Gert’s death, and under the command of Chase, Old Lace showed incredible affection and loyalty for other members of the team, particularly in an instance when Chase ordered her to attack two other Runaways, but she instead nuzzled them like a cat. Unfortuanately, this same loyalty would cost her her life in latest issue of Runaways, when Old Lace sacrifices herself to save the life of the youngest member of the team, Klara. It serves as the most moving moment of the series since Gertrude’s death, and is only fitting that Arsenic and Old Lace are finally at peace together. You can’t talk about super-pets without Krypto. People that may have had no idea about Streaky, Beppo, or any other character on this list, will likely know Krypto. He’s had his own cartoon series, toys, and issues devoted to him. He also has one of the most complicated continuities of any superhero pet. Traditionally, Krypto was Kal-El’s dog on Krypton, who was sent in a capsule to Earth in a test run for baby Superman’s trip. His ship was knocked off course, and Krypto didn’t arrive in Smallville until Clark Kent was a teenager. Throughout his history, Krypto has shown undying devotion to Superman and his friends, including sacrificing his life for him in Alan Moore’s "Whatever Happened to the Man of Tomorrow?" Post-Crisis, Krypto was removed from continuity, much like many other superpowered pets, but was eventually brought back (with an alternate origin) and has remained a prominent character ever since. My favorite single issue comic of all time is Superman #170 (before they reverted back to original numbering) written by Jeph Loeb, which features a storybook-like narrative featuring a puppy Krypto and his love for Superman. In the issue, he attacks the throat of Mongul as he is about to hurt Lois Lane, and the story ends with Superman having to leave Krypto in the care of the androids at the Fortress of Solitude. Of all the things Superman has endured, this is one of the most heart wrenching things I have ever read. Most recently, Krypto has been prominently featured in James Robinson’s Superman run and with the return of Connor Kent, will be featured in Geoff Johns’ Adventure Comics. At his best, Krypto is the perfect foil for writers to show off Superman’s humanity, as their relationship is not unlike that of any other master/canine, something that is deeply rooted within our culture.